Mold growth, water stains, or steady drips of water coming from the ceiling are among the most obvious signs of roof leaks. As a homeowner, you shouldn’t ignore even the smallest roof leaks, as leaks can be quite devastating to your home’s interior if not dealt with immediately. However, even though running water and water stains indicate roof leaks, these signs often don’t tell you where exactly the leaks are occurring. Knowing where the damage is situated is the first step of curbing the problem, which is a challenging and frustrating prospect for homeowners. To avoid frustrations, a trusted roofing contractor offer simple ways on correctly determining the cause of your roof leak woes. 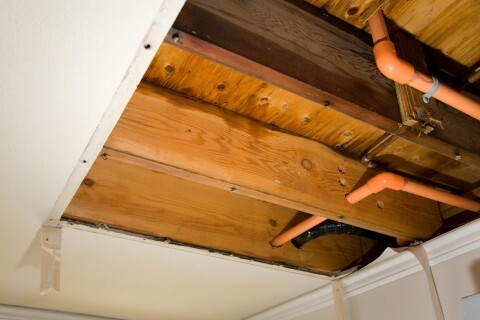 Running water or stains on your ceiling may be caused by roof leaks, but these might also be manifestations of problems in your plumbing or HVAC systems. Make sure that the water coming from your roof is indeed from a leak and not due to other problems. Also, look for signs of leaks on roof penetrations like chimneys, plumbing, and vents. Another way you can track a leak is climbing up your attic and, using a flashlight, begin looking for the worst things roof leaks can do, including mold and water stains. If your home doesn’t have any attic access, another way to look for the root cause is to go up the roof and slowly soak the area using a garden hose just above the places where leaks appear in the house. It’s also best to have a helper who can let you know when a drip becomes visible while you’re soaking your roof with water. Small leaks are more difficult to locate, since water may sometimes show up at a spot that’s distant from the actual leak. In this case, try looking at the underside of your roof for signs of shiners. Shiners are nails that missed the framing member when a carpenter nails the sheathing to the rafters. Should there be shiners on your roof, you’ll see that these nails tend to look white during a cold night and drip water during the day. Shiners are easy to deal with, as you can simply clip them off using side-cutting pliers. For bigger roof leaks, however, it might not be wise to do repairs on your own. To avoid worsening the problem, seek the help of companies like Shelton Roofing, which offers roof repair services for Sunnyvale homeowners.